As a business, it is important to have the ability to create your own invoices. Performa templates are important when a shipment needs to be paid for in advance. This performa invoice template helps you to create an invoice that is simple to create and professional in appearance. 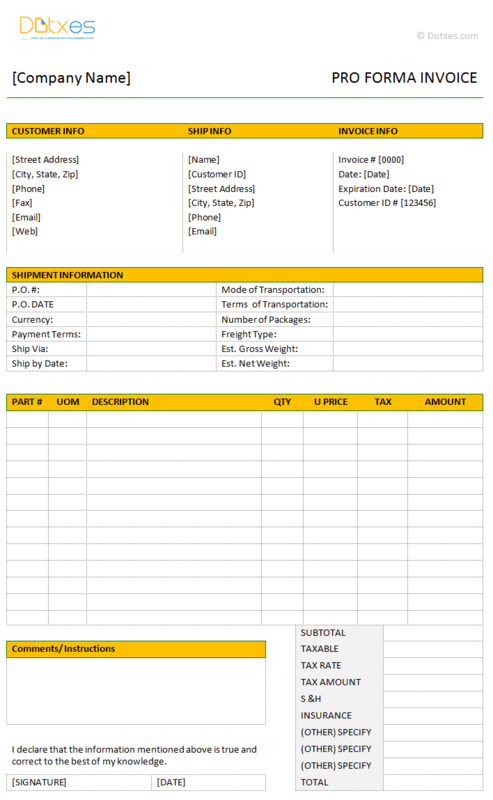 This template allows you to create an invoice that you can give out to your customers before they receive your products. The template includes space for the customer’s name and address as well as the shipping information for the shipment, this ensures that the invoice is given to the right person and it aids in record keeping purposes. The template also includes space for listing all of the products that will be received, to keep everything organized and documented, as well as their quantities. It includes space for the mode of transportation with which the shipment will arrive, the weight of the package, and all of the other shipment information that is relevant to the customer, so that there is not any confusion about what is going on. Include a specific time period in which the invoice will be valid. Either print the invoice or send it electronically as a PDF, to keep things straight and correct, rather than sending it as a Microsoft® Word document. Always list the selling price on your template as your cost to buy the product from the manufacturer, plus your mark-up amount.